These little wasp like bugs are also called hover flies, because that's what they do, hover over and around flowers and plants. They're not looking so much for the flower nectar or pollen, although as adults, they do eat that too, but for pests, like aphids. They lay their eggs nearby a good pest population so that the tiny larvae have something to eat as soon as they hatch. These flies, although they resemble a wasp in coloring, don't sting. You can entice them to stay in your garden by providing many flowering plants - don't stop at just flowers; they have a special attraction to dill and other umbelliferous plants, which is a good thing as dill is notoriously easy to self seed where it prefers to grow. Don't weed out these kinds of 'weeds' as they perform such a valuable service in your garden; attracting and nurturing predator populations. 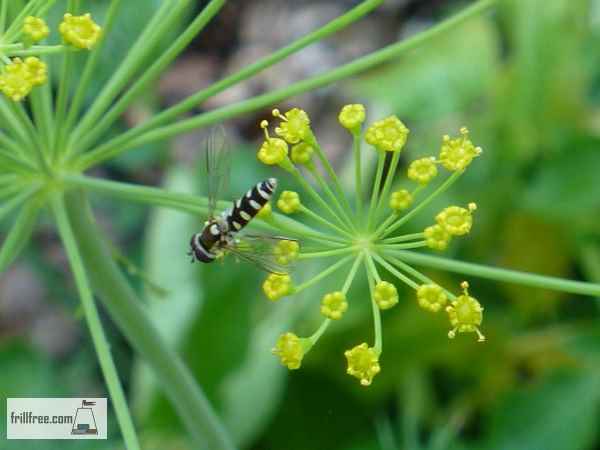 If you see hover flies in your garden, and you most likely will if you garden organically, you can rest easy knowing that they are busily taking care of the pests for you.